Disclosure: I received a copy of the film to facilitate this post. Captured with IMAX 3D cameras, Island of Lemurs: Madagascar takes audiences on a spectacular journey to the remote and wondrous world of Madagascar, where lemurs arrived millions of years ago as castaways. They’ve since evolved into hundreds of diverse species, but are now highly endangered. Island of Lemurs: Madagascar highlights the tireless efforts of trailblazing scientist Dr. Patricia C. Wright and her lifelong mission to help these strange and adorable creatures survive in the modern world. My knowledge of lemurs was next to nothing before watching Warner Bros and IMAX Entertainment’s Island of Lemurs: Madagascar. I knew that they were in Africa, but didn’t realize that lemurs only live in Madagascar. Did you know that they are the planet’s oldest living primate? They survived the asteroid that killed the dinosaurs. Watching the film gave me a new respect and appreciation for this beautiful mammal. In Island of Lemurs: Madagascar, we are swept away to the lush forests of Madagascar, a paradise in its own right. Multiple types of lemurs live on the island and we are able to catch a glimpse of many of them. Did you know that there was a Mouse Lemur? I didn’t. The film is mostly narrated by Morgan Freeman, but also includes portions where Dr. Patricia C. Wright tells us about lemurs and her experiences with them. I enjoyed watching the lemurs in their natural habitat. I thought it was cool the way they “sing” together as a family in a strange, but wonderful chorus. I was especially touched by Dr. Wright. Her love for lemurs is evident and I witnessed the first time she ever held a lemur in her arms. It brought tears to my eyes because I could see how much these creatures meant to her. The film is 41 minutes in length, but in that short time, prepare to be educated, entertained and enamoured by the stars: the lemurs. I hope that the scientists are successful in getting them off the endangered species list and that they thrive and grow in their natural habitat. 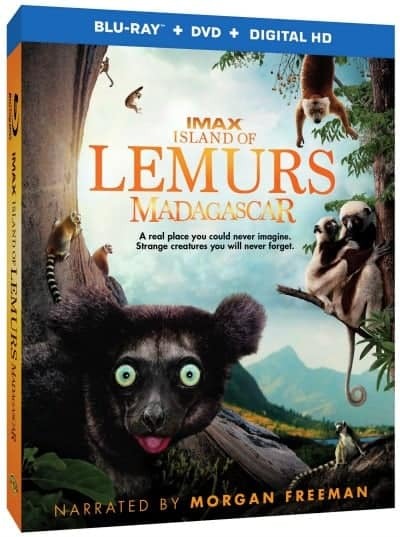 Island of Lemurs: Madagascar also has 3D version you can watch if you have all the equipment. I don’t unfortunately, but I bet it would be spectacular to watch. I watched the 2D version on Blu-ray and was amazed by the cinematography and felt like I was right there with the lemurs in Madagascar. This is a film that the whole family can enjoy watching together! Own ISLAND OF LEMURS: MADAGASCAR on Blu-ray combo pack and Digital HD on March 31. Connect with Island of Lemurs: Madagascar on Facebook. I enjoy some of these films…mostly the ocean ones, but I just saw a preview for this and it grabbed my attention. The photography is beautiful and the lemurs sound really interesting. Now, I can’t wait to see it.